external and internal threads; and 4) differences in thread designation. 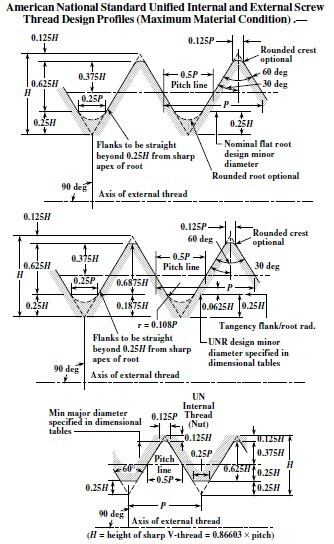 Dimensional Acceptability, Inch or Metric Screw Threads (UN, UNR, UNJ, M, and MJ). to the outdated American National screw threads. more tolerance is provided for fine threads than for coarse threads of the same pitch. Where previous tolerances were more liberal than required, they were reduced. 0.25P flat width of the Basic Profile is optional. 0.625H (where H is the height of a sharp V-thread) below the basic major diameter. partially or completely rounded crests. 0.125P flat width of the Basic Profile.There is no internal UNR screw thread.